‘None the Bloody Wiser’ is the title of the conversation between George Shaw and Gordon Burn that appeared in The Sly and Unseen Day. 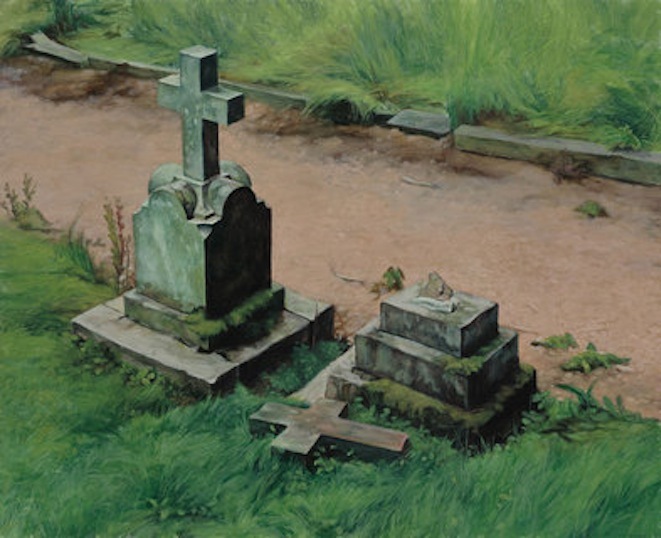 It reveals that the artist’s father had died, I think in 2006. 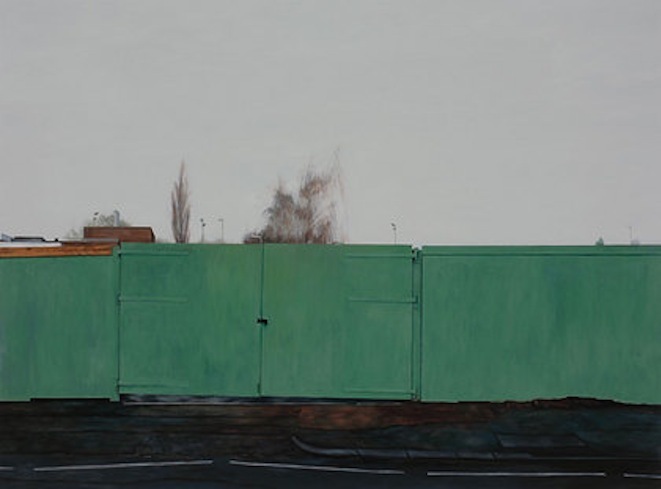 One of the results of the death of George senior was that his son, by the time of the 2007 interview with Burn, hadn’t really painted since his bereavement, though it seems he was painting while his father was dying. I haven’t been able to track down that painting, though I’ll keep looking. 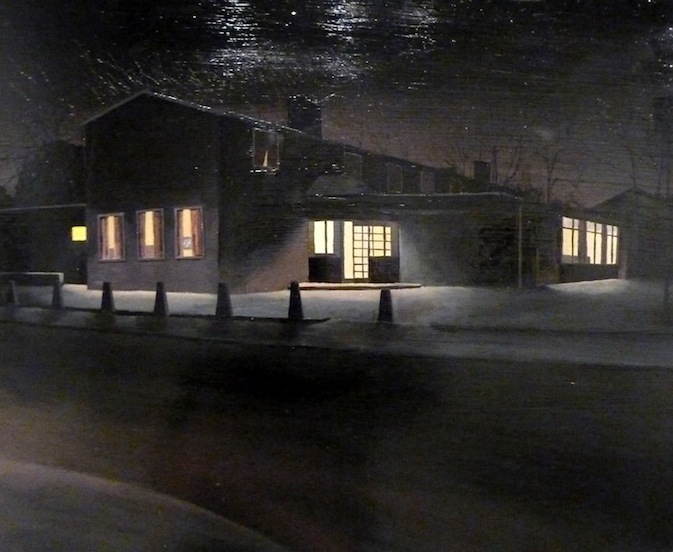 There aren’t many paintings that are dated after the Ash Wednesday series, I mean not much from 2005 or 2006. Indeed it’s not until 2009 that George seems to have been able to get back to work wholeheartedly. Not until then that he was able to incorporate the death of his father into paintings of Tile Hill. 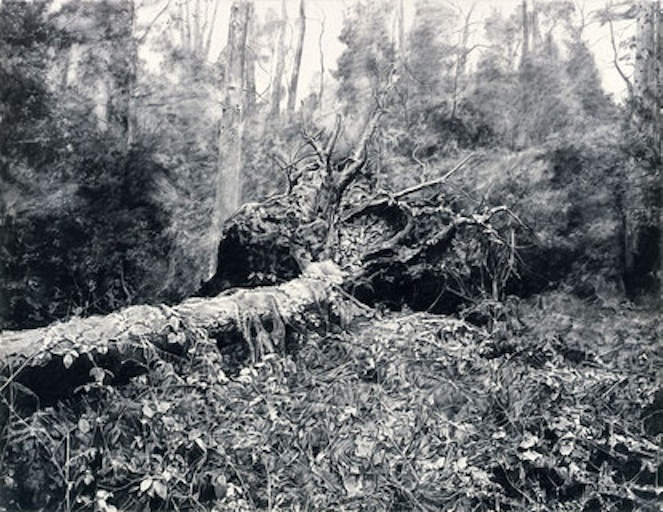 But this he did in the ambitious - and superb - exhibition, ‘Woodsman’, which was served up at the Wilkinson Gallery from 28 February to April 9, 2009. 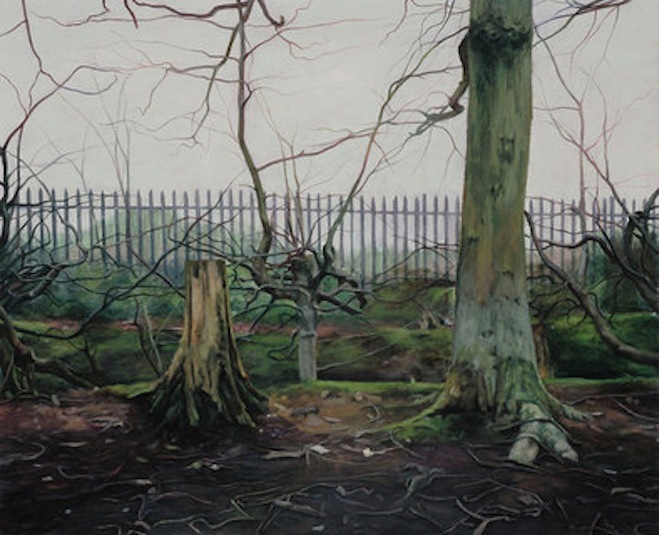 Installation shot of George Shaw’s ‘Woodsman’ show at Wilkinson Gallery, 2009. Photograph by Peter White. Death of a tree = death of the father? Well, yes that comes into it, I’m sure. 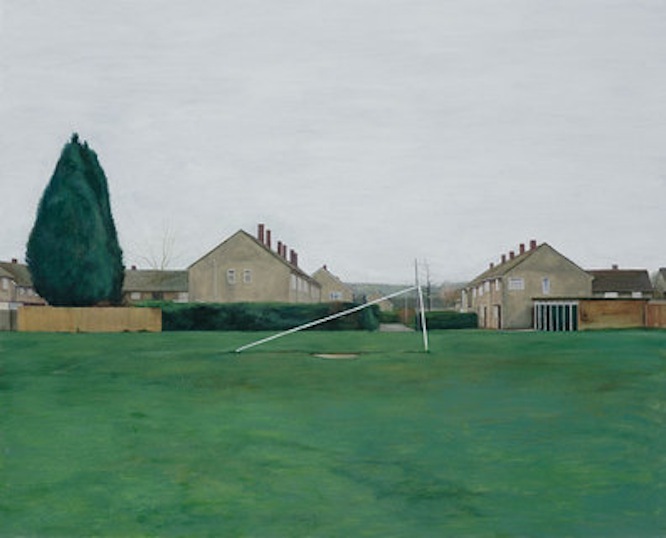 Though as always with George Shaw, things are neither simple nor naive. A second gallery contained a display of new Humbrol paintings. There were eight, four of which were bigger than any Shaw had painted before. The installation view below illustrates the point. The two paintings on the right are 44x53cm, which had been the standard size at the start of the Tile Hill project, while the painting on the left is a whopping 147x196cm. 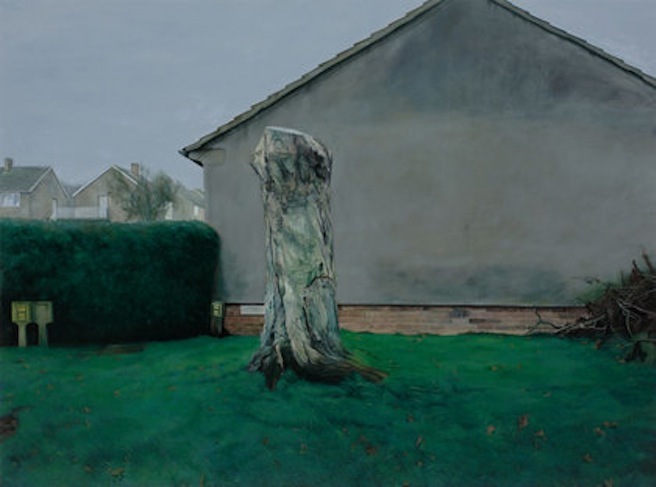 LIke Paul Noble, George Shaw gained in confidence over the years, and knowing he had found a rich seam of work, clearly decided to wholeheartedly mine it. Let’s start with the large painting on the left of the above installation shot, The End of Time. It’s the site of a demolished pub, once called Woodsman. 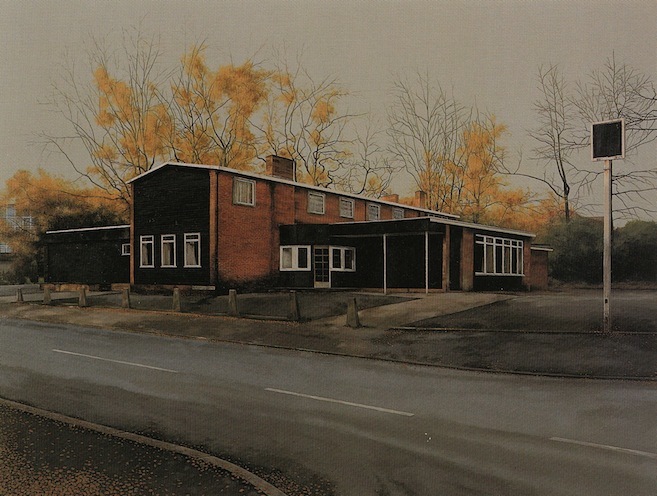 As illustrated below, George Shaw painted the pub in 2002. It had been derelict since being damaged by fire in 2000, and was finally demolished in 2005. I think Shaw may have had the flames in mind when he painted this scene, what I take to be wispy autumn leaves evoking both fire and smoke. and when I fell on the floor.. If the painter got through quite a few tinnies of black enamel in rendering the above, green is what he splashed out on in the paintings of ‘Woodsman’ in general, as the two smaller pictures next to The End of Time demonstrate. First, there’s This Sporting Life, the name of a 1960 novel by David Storey: rugby league player and an author who wrote about working-class life in the north of England. 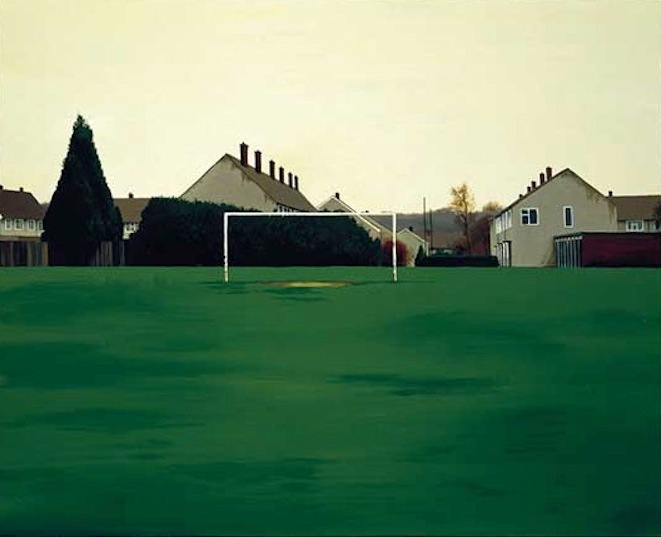 Below is a still from the Channel 4 documentary, The Late George Shaw. 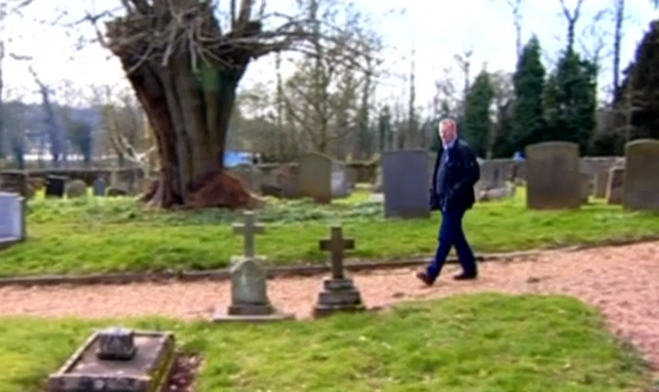 It shows George in the summer of 2004, aged 38, walking in the cemetery attached to Berkswell Church. Still a relatively young man, he is about to walk past two monuments topped with crosses. 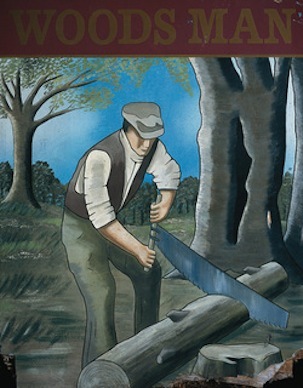 Below are four more Woodsman paintings with more than their fair share of green in them. 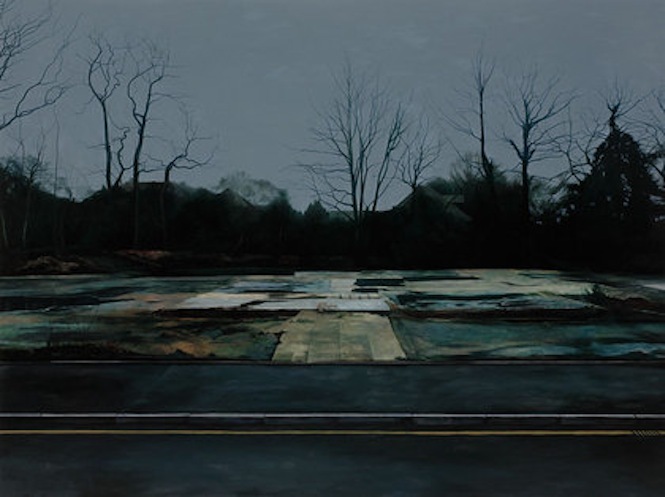 George Shaw. Installation shot of ‘Woodsman’ show at Wilkinson Gallery, 2009. Photograph by Peter White. I had no idea what the title, No Returns, referred to, until I matched up some of the background detail with detail (cypress tree, flat-roofed buildings of a certain height) in the painting below, which is from 2003. The earlier picture shows a back entrance to the library which George - to begin with no doubt under the encouragement of his father - would use to give himself access to books. Alas, the day comes when the door to literature was closed to George. That’s to say, the boarding up of the entrance to the library symbolises the death of his father. No returns. Returning to the last installation shot, below is one of the smaller paintings that feature in between the two large ones. When first and last things sound the same echoes Fallen More Slowly. 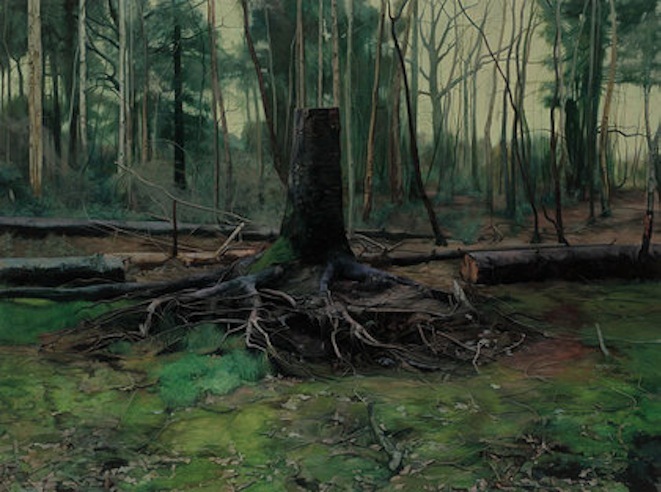 George Shaw may be recalling walking through the woods with his father, when George was a child and his father a mature man. Time has passed. By 2009, George is the one walking tall, while his father has been cut down. Below is the second big picture in the last installation shot. It revisits the tree that George commemorated in Ash Wednesday: 8am. Only this time there’s no sun to throw a shadow of the tree onto the gable end of the house on Frisby Road. And if there was a sun it wouldn’t make any difference, because now there is no tree to throw intricate shadows of branch. Just a stump. The title, It is finished, leads me to think that the painting is inspired by the conclusion of the episode in The Woodlanders that I referred to in the Ash Wednesday page. If you recall, a character in Thomas Hardy’s novel makes himself ill thinking that an elm tree - which was a sapling when he was a boy, but is now a mature tree that sways in the wind - is going to fall on his house. He takes to his bed and, though he is only 55, the doctor fears for his patient’s continued existence. It’s resolved that the tree must come down in order to save the man’s life. So down it comes, cut down by the woodlanders. “It is gone, see,” says the doctor. 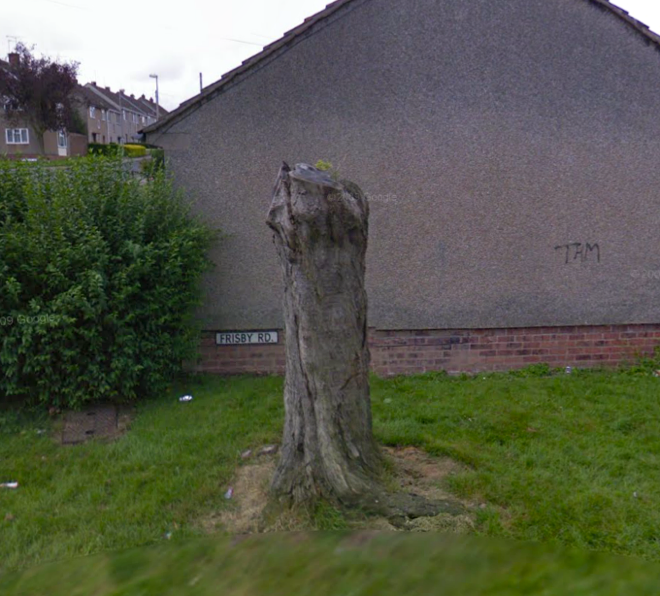 The ‘old man’ observes the vacant patch in place of the branched column that he was used to seeing, and is overwhelmed. He has to be carried back to bed where he mutters: “O it is gone! - where - where?” He dies that evening as the sun goes down. Any connection between Hardy’s ‘It is gone’ and Shaw’s ‘it is finished’? Any connection between the doomed character in the Woodlanders and George senior ensconced in number 57? I leave you to make up your own mind. 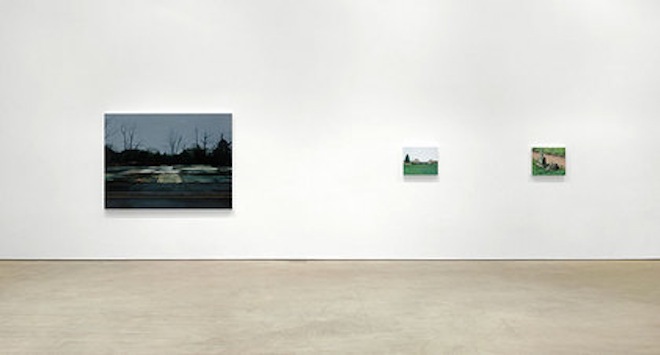 The two installation shots further up the page show seven of the eight paintings that make up ‘Woodsman’. There is one more and it’s another of the very large ones. The tree has been chopped down by a woodsman, but by the state of the roots it was vulnerable to being blown down by nature. In other words, its time had come. As George’s father’s time had come in 2005 or 2006. The separation of the upper part of the tree from the lower trunk and the roots reminds me of something. When Thomas Hardy died in 1928, aged 88, he was living in a fine house just three miles from the humble home in which he was born in Upper Bockhampton. The immediate area - his Tile Hill - crops up time after time in his great novels and his poetry. Of course, he desired to be buried in the local churchyard, next to the tombs of his parents, no-one would have expected anything else. Stumpy Thomas had roots! And those roots went deep into the ground he’d walked all his life. But it didn’t work out quite like that. JM Barrie, the brilliant but peculiar Scottish writer who became world-famous following the success of Peter Pan, was a great admirer of Thomas Hardy, and became a friend of the family. Through his influence, a surgeon was employed to cut out Hardy’s heart, which was duly buried in the grave of his first wife alongside his parents. And at Barrie’s instigation the rest of Hardy’s remains were laid in Poets’ Corner of Westminster Abbey. To a modern sensibility, that seems like an unnatural division. So I should say this. 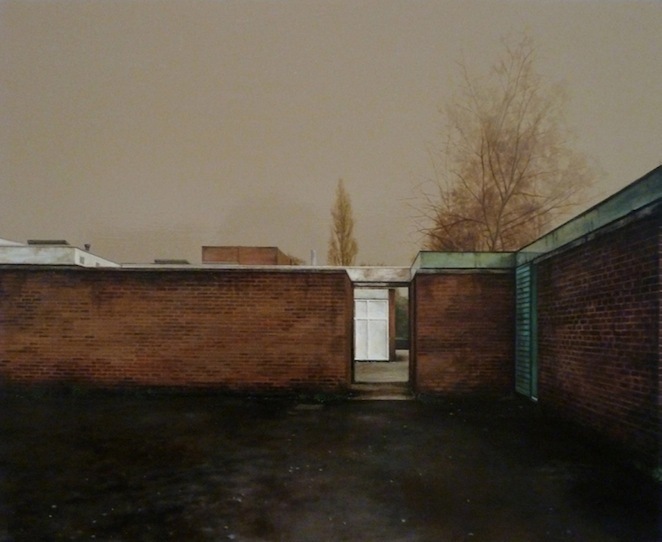 When, in the fullness of time, the painter George Shaw dies, and if George and his family have chosen to dispose of his remains in Tile Hill, then any request from a writer - or anybody else - for parts of him to be laid to rest somewhere else, should be taken to be a joke in very bad taste.